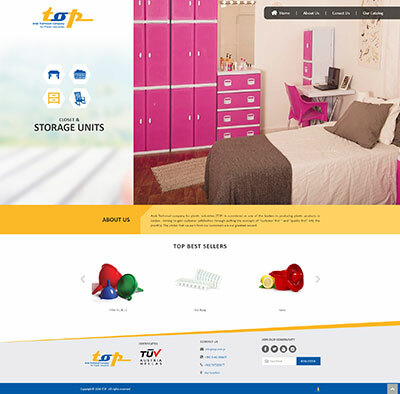 Arab Technical Company for Plastic Industries (TOP), the leading Jordanian company in the field of manufactured plastic products, has launched its new website www.top.com.jo powered by ESKA® CMS. ESKADENIA Software development team has implemented an easy-to-use interface that enables users to easily navigate through TOP’s product catalogues, photos, services and organization’s information. Furthermore, the website allows users to access the organization’s profiles and share website pages across various social media networks. TOP’s new website gives a seamless transition across all digital devices, including desktop and mobile devices. The TOP team was excited to launch the new website with the expectation of creating greater user experience and helping their customers achieve a greater understanding of their brand. TOP’s website combines the brand’s colours and an interactive design to create a simple and attractive navigation process. ESKA® CMS is a web-enabled, flexible and powerful platform to create websites, manage, edit and publish their content. It enables administrators and content editors to benefit from a wide range of rich features without the need for technical assistance or knowledge of underlying technologies and HTML or XML languages. ESKADENIA® Software is a two-time MENA Award Winner & CMMI® level 3 certified company that is active in the design, development and deployment of a range of software products in the Telecommunications, Insurance, Enterprise, Education, Health, and Internet application areas. The company is based in Jordan and has sales activities in Europe, the Middle East and Africa; more than 85% of its sales are exported to the global market. ESKADENIA Software is a product and market-oriented organization that assists enterprises and promotes businesses by use of highly effective IT strategies, solutions and tools. ESKADENIA Software strongly believes that a company's achievement is based on the success of its Human Resources and the commitment to quality and excellence that each one holds strong to. ESKADENIA endeavors as a team to maintain quality and customer respect, build up perseverance, and foster innovation. For more information, visit www.eskadenia.com, or contact us at pr@eskadenia.com.